After returning to the boat we moved to another marina with a few nicer amenities (still less expensive than Panama or Carenero). We can even walk to the village of Fronteras which was the main selling point as walking/running are necessary for us. The walk consists of leaving the marina then a traverse through a swamp (wannabe rain forest) to a teak forest which is very unique and after two miles into the "lovely?" suburbs of Fronteras (frontier) or Rio Dulce. And then beautiful downtown Rio Dulce. We departed the Rio Dulce by walking into Fronteras (2 miles) and onto a nice bus. Six hours later after two buses we arrived in the town of Copan Ruinas in Honduras. Copan in focusing on tourists visiting the Mayan ruins in this beautiful valley. 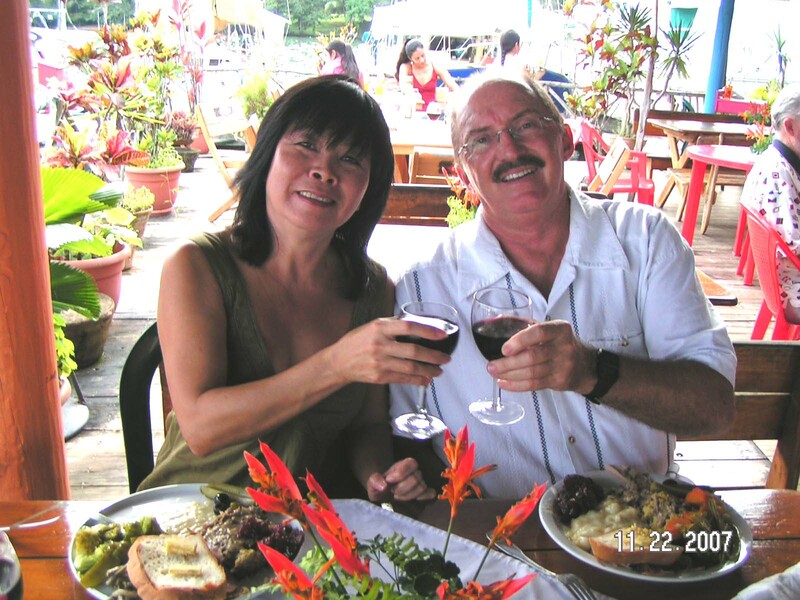 Our B&B, Casa de Cafe, was run by a Howard from New York who came to Honduras to teach 18 years ago and never left. The town square had beautiful flora. And when we were not touring the ruins and museums we hung out with the local Hondurans. A short walk was all that was needed to the Ruins the next day after a delightful breakfast at the Bed & Breakfast and our first scene was of parrots flying everywhere. They are as common as pigeons in this region but still a real treat to view them in flight and always talking to each other when flying. What follows are many pictures of the actual ruins. The Ruins of Copan are considered the Athens of the New World by some Maya archaeologists. If Tikal is compared to New York then Copan is Paris. This represents a premier position among the Maya sites as to the quantity of stone sculptures including stelae and altars. There is the longest Hieroglyphic Stairway that likely discribes the history of the ruling dynasties over the almost 2000 years of existence. Roy and Yen walk to the first of many structures. The goddess of Copan shows her pose. Fellow cruisers Roy and Marlene from S/V Damiana The hieroglyphic stairway to heaven on Structure 26. The altar Q was a shrine of all the sixteen rulers of this Mayan site - difficult to tell the difference from ruler "Jaguar Smoke" from "Smoke Smoke"
We enjoyed a real Thanksgiving Day at Mario's Marina with fellow cruisers. Leaving the Rio Dulce was great as the time had come to move on. We had Mike and Greg on board and it was down the river on December 2nd. The Rio Dulce bridge was always a back drop while there. Passing the local fisherman is a treat while viewing their feat of standing on a postage stamp in the middle of the river. We stopped into Texan Bay marina to allow us to check out of Guatemala the next day and spent three days there. What a great place - for cruisers do not miss this place if entering the Rio Dulce - it was by far the coolest marina we have ever visited. Great food and the hospitality is by far the best we have ever encountered. Just be ready for a great time. 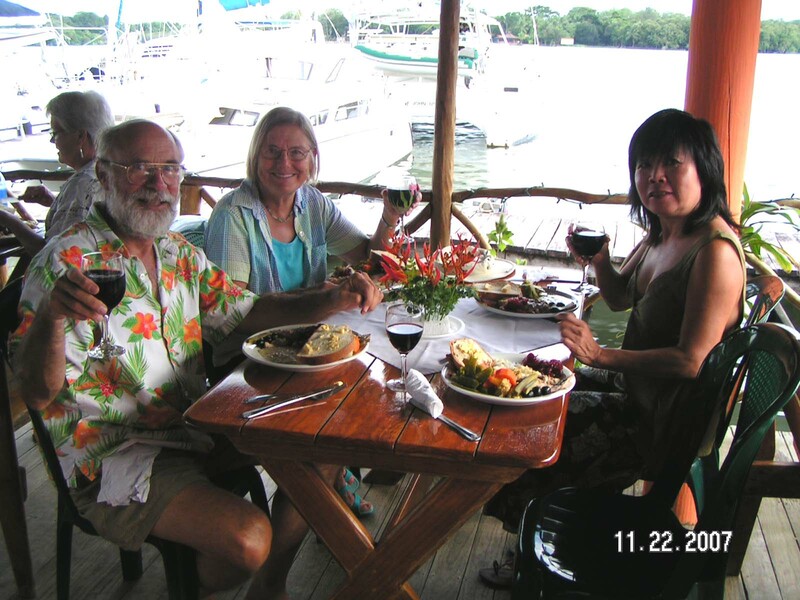 On December 5th, just like that we were out of the Rio Dulce after five months in there. It was a nice stay but happy to be on the move again. Here is Mike advancing from swab to mate after cleaning the dingy. We had to tie the boat up in front of all the water lilies. What a great time exploring the surrounding canals and creeks in a rain forest environment. Makes the sailor shake his head.